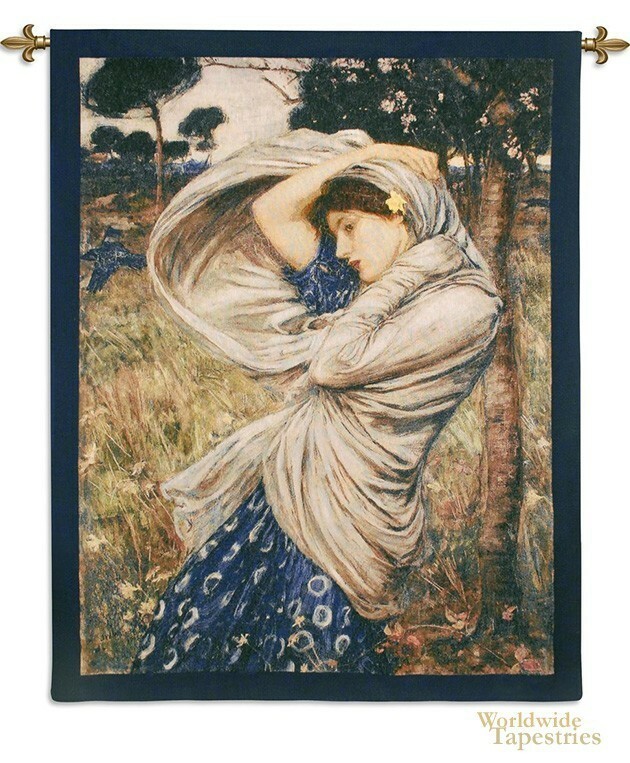 In Boreas tapestry we see a woman standing in the wind, the work of John William Waterhouse. This artist in the Pre-Raphaelic style, created works which have an idyllic and other worldly quality about them. In this piece, the woman in the windy landscape is named after the Greek god of the North wind. His love of the classic design elements of flowing robes is reflected here in her garment shows lines and creases echo the lines of the wind blown grasses in the forest behind her. This work has the hallmarks of Waterhouses' works which are neo classicism, with classic inspired subject matter from ancient Greece or Rome then created with his distict style that is unique. Boreas tapestry is backed with a lining and has a tunnel for easy hanging. Note: tapestry rod and tassels, where pictured, are not included in the price.